History of the carousel and its restoration project. Allen Herschell, a Scotsman born in 1851, is thought to have built the Prairie Village carousel. Herschell came to this country in 1870, and with his partner James Armatige began the manufacture of steam engines. While seeking medical treatment, he reportedly witnessed a carousel in operation and decided to build one himself. His partner didn’t buy into the idea, but Herschell moved forward anyway and spent the following two years building his first merry-go-round. During the 1890s, his company built over 300 carousels, selling and shipping them throughout the world. This new ride was extremely popular, but the economy took a turn for the worse in 1899 and eventually the firm failed. Later reorganized as the Herschell-Spillman Company, the new firm prospered and became America’s premier carousel builder, remaining in operation until 1955. Earliest examples of the carousel go back to 1800, but mass production of the rides didn’t begin until 1860 when the Dentzel brothers, German wood carvers, came to this country. The carousel animals, like those on the merry-go-round at Prairie Village, are made by gluing together blocks of basswood or poplar, then carving them into various animals. 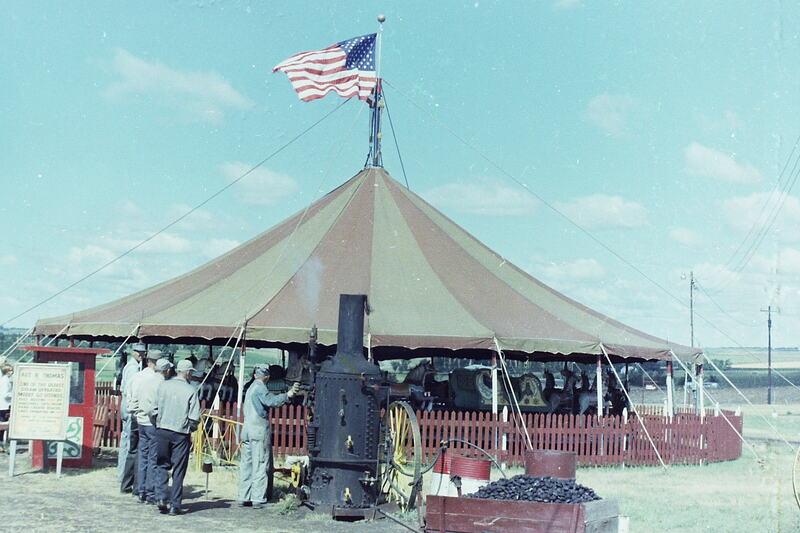 For years, the carousel at Prairie Village toured towns all over the Midwest as the centerpiece of Thomas Shows, a carnival based in Lennox, SD. Sometime prior to the 1950s, the ride was replaced with a newer machine and the old one was dismantled and put into a barn in North Dakota. Time, conditions, and lack of use and care were hard on the carousel, but in the mid-1950s efforts were begun to restore it. The job fell to Floyd Caryle, who spent five years reassembling and restoring the carnival ride. 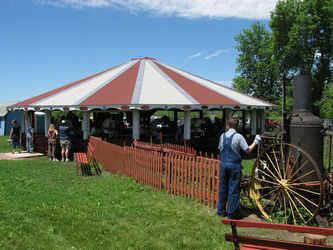 In 1966, Joe Habeger, one of the original founders of Prairie Village, and a group of individuals contacted Art B. Thomas to inquire if the carousel could be purchased. Thomas agreed and the historic carousel has been a fixture at Prairie Village ever since. Several improvements were made to prevent damage to the ride over the years, including installing a cover over the carousel, then eventually a full enclosure to keep rain and snow from reaching the mechanism during harsh weather. But the constant operation of the ride, which for years has occurred mainly via electric power with steam reserved for special events, has taken its toll. By 2010, it was becoming apparent that continued use of this treasure would certainly spell its eventual breakdown and possible demise. 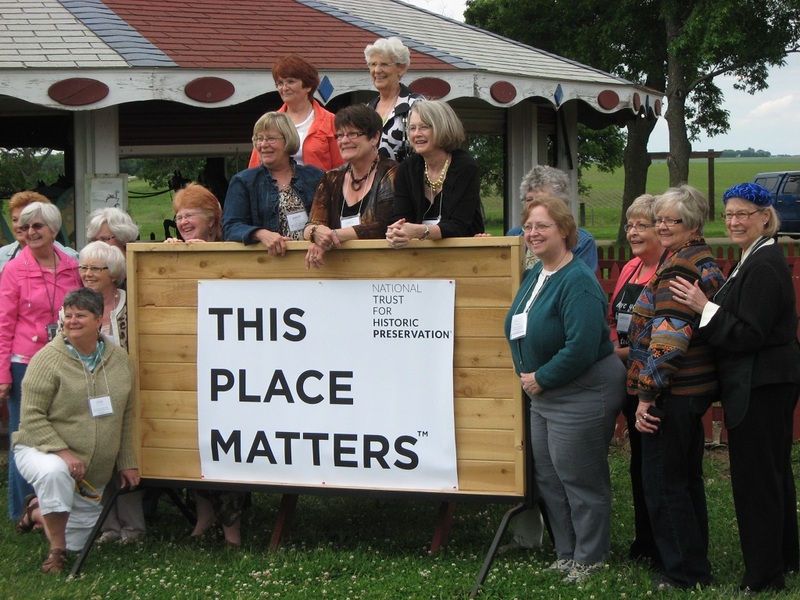 The local Prairie Pasque Questers Club took early interest and initiative in the possibility of a much-needed restoration for the Prairie Village carousel. The Questers began raising funds, and estimates for the project were sought. After a few years of continued fund raising by the Questers and Prairie Village, coupled with a private lead gift for the project, the Prairie Historical Society in 2016 entered into an agreement with Carousel Works in Mansfield, Ohio for a complete renovation of the carousel. The company traveled to Madison in October, 2016, completely disassembled the carousel, and transported it to their Ohio facility for the work that would begin later in the winter. Also during the fall of 2016, the carousel was awarded placement on the National Register of Historic Places. In March, 2017, actual work began on all components of the primary carousel gallery, with plans to restore the carousel as much as possible to its original, as-built condition. The carousel returned to Prairie Village in late July, 2018 and was reassembled and tested. A huge welcome home celebration was held August 11, 2018, kicking off a new generation of this incredibly rare carousel bringing history to life at Prairie Village.